Air conditioning without electricity? Now there is a concept that would sit well with today’s green movement. Long before Dubai’s state of the art skyscrapers started sprouting traditional architecture featured built in air conditioning. Architects incorporated wind towers to help cool the blazing heat. The necessity of dealing with the harsh climate led to functional architectural detail. Ingenious and attractive the structure of the wind towers catches the breeze and funnels it down into the room below cooling it. If only the rooftop air conditioning systems of today looked so good. 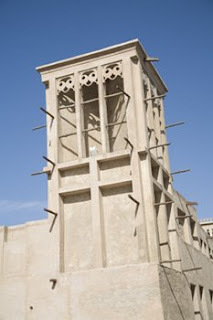 A large concentration and perhaps some of the best example of wind towers in Dubai cab be found in the Bastakia section of Dubai near the creek. I’ll be writing more on the charms of Bastakia, where I stayed. Funny how a section of a city with some of Dubai’s lowest buildings makes you want to look up. Hi! I can not find your email adress so I am leaving this in a comment…would you be interested in a link exchange with my site, journeyetc.com. 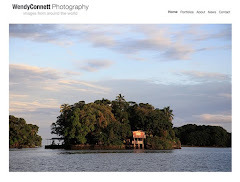 I mainly write about travel, if you are interested please send me a private message. You have a nice blog and it's interesting reading about Wind Towers. Thank you. I'll take a look at your post.